Flank your door with two adorable sentries using these Esschert Design Giant Hedgehog Boot Brushes. Placing these units next to your door subtly and whimsically encourages visitors to wipe their shoes prior to entering your home, helping your floors remain tidy. Cast iron creates the frame and expressive face of each hedgehog, while a wooden center in each accommodates the coco fibers. This creates fun and functioning boot brushes, easily wiping excess dirt from shoes. Situate one of these items at your front door and one at your back entry, or place them both at your busiest entrance for plenty of versatility. Pads on the bottom of the units also enable you to rest them indoors, for a fun adornment. The cast iron construction remains durable for many seasons, and the items are easy to clean with a quick rinse. 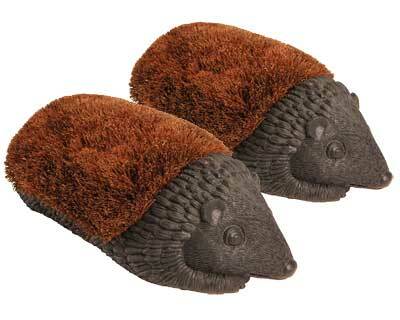 Provide fun spots for guests to wipe their shoes with these Giant Hedgehog Boot Brushes. Note: This case pack contains 2 of the Esschert Design Giant Hedgehog Boot Brushes.